Buddy Baker was Disney music. Mostly known as the composer of The Haunted Mansion song and score, he also was a composer of films (Wicked Woman, The Fox and the Hound), TV shows (the original Mickey Mouse Club), and numerous theme park attractions (World of Motion, Wonders of China, Kitchen Kaberet, Impressions de France) around the globe. 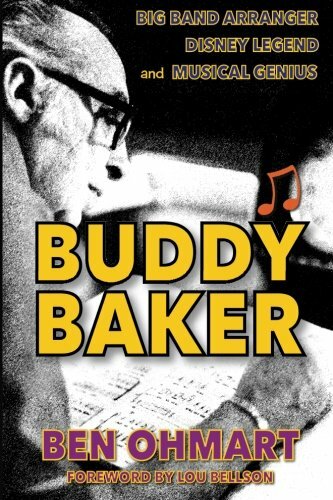 From a humble beginning in Springfield, Missouri, Buddy Baker began composing and arranging music at an early age. He worked for many of the top big bands, then began arranging music on hit radio shows (The Bob Hope Show, The Eddie Cantor Show, The Jack Benny Program) before getting into film. His 30+ year career with the Walt Disney Company put him at the top of his field, working alongside many of the greats, including Walt Disney himself. This is Buddy’s story. Not a book on Disney music, but a tribute to one of the greatest musical minds the world has ever known. His music will play on forever.